TeraThink attended SAP TechEd 2017 in sunny Las Vegas. SAP transported us from present day Vegas to the final frontier of the digital revolution. The conference kicked off with a keynote from Björn Goerke, SAP’s Chief Technology Officer. As a bonus, he came dressed as the legendary Captain Kirk on the mythical starship Enterprise! Goerke walked us through SAP’s vision of the digital transformation facing many present day organizations in their attempt to go digital (boldly) and blur the lines between their physical and virtual world. SAP indulged the crowd with some space age demos of their new Leonardo platform to use drones, machine learning, spatial analytics, and computer vision to help Dole to automate farming of hundreds of acres of palm trees. Who doesn’t love drones and artificial intelligence? And what better way to indulge a room full of developers than to dress up as Captain Kirk, wear Vulcan ears, and present from the bridge of the Enterprise? The conference resembled more of a traditional industry conference than the colorful keynote. The first event was the ASUG preconference seminar. TeraThink attended a HANA Native App development seminar to extend from the cutting edge to the bleeding edge of big data and in-memory databases. 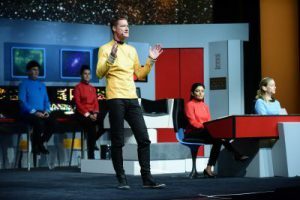 SAP TechEd continued with the keynote (see numerous Trek reference above), educational sessions, after hours networking receptions, buzzing show floor, and more. The show floor had more virtual reality than previous TechEds. We had an opportunity to try on the Microsoft holo-lens (yes it’s real) and also a virtual reality demo of the future of supply chain. Yes, we’re talking mass personalization of products delivered to your location in real time consumed over the cloud, shared over social media, with real time updates to finance, management and the like. It’s a mouthful but it’s the future we’re talking about. SAP TechEd 2017 was filled with the hottest technology trends leading us into the future. This included in-memory databases for Big Data, Blockchain, Internet of Things (IoT), Machine Learning, Artificial Intelligence, conversational UI assistants, Cloud, HANA 2.0, Native apps for Big Data, Responsive mobile-first UI, and optimized developer tools. SAP continued to center their approach to the future on HANA, their flagship in-memory database. HANA 2.0 contains more bells and whistles to make it available over the cloud and even more flexible. Blockchain is finally mainstream to streamline value transfers without a trusted authority. SAP combines all these technology trends into its flagship product SAP S/4 HANA. The product is the logical conclusion of the conference. We had a chance to prepare for its ascent into the marketplace. Another great TechEd for Dominion. Are you interested in Star Trek or bringing the future to your organization? If so, please contact us or leave a comment below. We would love to talk to you.